SKY All-in-one Machine comes with high-performance CPU and Nibiru OS, equipped with 5.5Inch TFT Display Screen which supports 1080P Resolution Display & Super 3D effect. *OS: Nibiru operating system (develop based on Android 4.4.2). 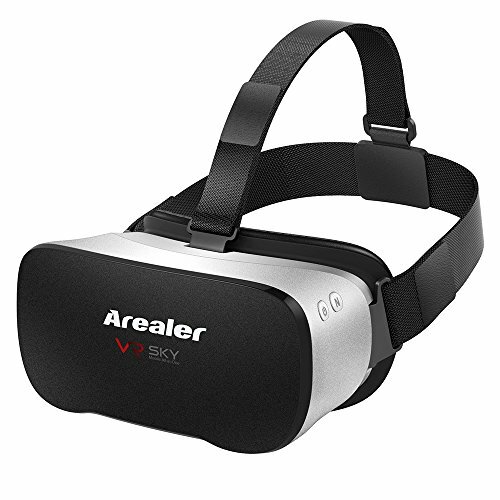 With built-in APP and is compatible with most of VR Games & Videos on the market. *Sensor: Gravity & Gyroscope (High-performance 9-axial sensor). Compatible Applications: Compatible with Nibiru customized 3D /2D apps, Google play, YouTube, Third party apps, etc. *Built-in 4000mAh rechargeable Li-polymer battery for long standby time. Interface: 1 * Standard USB; 1 * Micro USB port (Power Input 5V/2A); 1 * TF Card slot; 1 * Earphone Output jack. [1080P FHD High-definition Screen] VR SKY is equipped with 5.5inch TFT-LCD display screen which supports resolution up to 1920*1080 and Refresh Rate at 70Hz(Much higher FPS than average performance), offering more high-definition & fluent frame with low afterglow and can protect user's eyes better with much less harmful blue ray energy. [Fully-immersive Virtual Reality Helmet] 360°three-dimensional space (without dead corner) interactive system delivers more authentic immersive Virtual Reality experience. And embedded with nine-axle sensors which supports 360° view of head tracking (360° head somatic sensory control), making you feel that you are on the scene. Furthermore, it provides 2D, 3D and 360° panorama format to be chosen. [Abundant Game Resources & Movie Resources] The Team offers you more than 100 Virtual Reality Games (The VR Games are being updated) and a plenty of 3D Movies. No need for Smartphone & PC, you can Enjoy 1080p HD Movie / 3D Movie (offering clear and exquisite 3D picture) / Wonderful Immersive Games. Just enjoy wonderful VR Games and Movie Resources. [High-end Lens && Large FOV]VR SKY uses Anti-blue rays double 45mm Aspheric high transparency (PMMA)Lenses which is more pure and offers distortionless image. VR SKY owns optimal 100°FOV (super similar to human eyes, giving you a broad perspective) and ultra-low levels of light leak, can achieve the latency time within ultra-short time, so you not fell obvious vertiginous sensation. The VR Headset supports adjusting pupil distance and is compatible with naked eyes with myopia under 600 degrees. [Immersive Game Experience] VR SKY supports 360°three-dimensional space interactive system which brings you wonderful Immersive panorama virtual reality experience, and VR SKY also supports surround output, can enhance your Immersive Sense and make you feel like on the scene when experiencing VR games. And nine-axle attitude indicator are embedded to let the player totally immerse in the world of games through the player's actual rotation of head.